A story about an endless queue in Moscow in which thousands waited to see a major Christian relic brought from Greece. Ahead of Orthodox Church Christmas on January 7, one of the main Christian relics, the Gifts of the Magi, were brought to Moscow from the Monastery of St. Paul on Mount Athos in Greece. 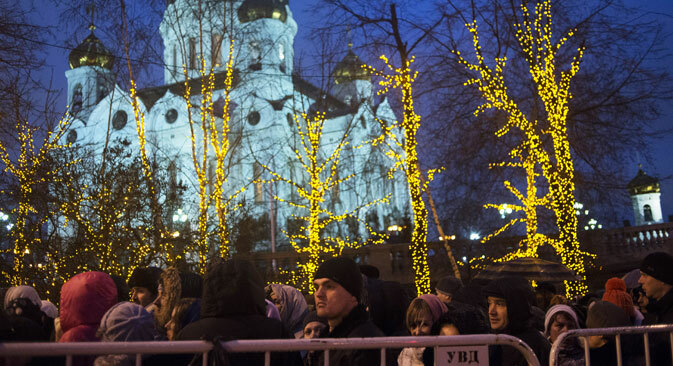 To get to see the relic, which is displayed in Christ the Savior Cathedral, thousands of people spend up to nine hours waiting in a queue. This outburst of religious feeling displayed by Muscovites and visitors to the city translated into a large-scale operation, involving the police, ambulance and rescue crews, and disrupting public transport and other traffic in part of the city. RBTH interviewed people in the waiting line to find out what they were feeling. The endless queue is separated from the road by metal crowd control barriers and is divided into segments, creating a chain of enclosures with people gradually getting into the one nearest to the cathedral. Everybody is smiling, including police officers. “Why have you joined this horrendous queue?” I ask two women, who have spirituality written all over their faces. In other words, an Orthodox believer must first work a bit before they get anything. Because of the line to the cathedral, there is a lot of police, including riot-police, ambulance cars, and Emergencies Ministry personnel here. It’s as if the danger is simultaneously coming from the people and threatening them. There are traffic jams everywhere, the buses and the underground are overcrowded. The city is finding it difficult to adapt when all of a sudden it has to accommodate a path for a spiritual journey. There is a persistent nasty drizzle. On the horizon, one can make out beautiful but hopelessly distant snow-white walls and golden domes of Christ the Savior Cathedral. There are people running along the other side of the barriers hoping to spot a place where they can squeeze inside the queue. A young policeman is being besieged by elderly women, who are asking him to let them through because every part of their bodies is aching. A bit further on, another babushka is waving her cloth bag in indignation and shouting at two policemen nearby. "How can you treat people like this? Why is there no information? Why are we waiting for so long?" Somewhere deep inside the crowd a female voice is shouting that the wait is so long because somewhere at the head of the line various VIPs are being let through. It is indeed a difficult wait, but the line is so long because thousands of people want to get inside the cathedral. Worried-looking middle-aged men are pulling up in a clapped-out car. Two elderly ladies are engrossed in a conversation, while sipping hot tea from plastic cups provided by volunteers. The line is moving, and the policemen open the barriers. People start running and elbowing each other. Everybody knows that they will be allowed to move just several dozen meters, till the next barrier. But still they are running and pressing against each other in the first rows. Some are smiling: It is easier to wait when you get a chance to do a bit of running now and then. “Have you been waiting long?” I ask somebody in the line. Nearby is an underground station, a bus stop, and a pier ticket office. The queue is moving slowly along the Moscow River. To the left there are tanks with drinking water, field kitchens offering steaming hot food, and plastic toilet cabins. Across the road to the left of the line there are luxury apartment blocks and upmarket commercial properties. Lidia is 66, next to her is her friend, Lena, also wearing the same lipstick. Lena is 73. Lidia and her lady friend are edging closer to me. They are very cheerful, their eyes sparkling. “Do you think many people here are hoping for a miracle?” I ask. At the very start of the line there is Alena, 18, in a stylish jacket the same bright-pink color as the two cheerful pensioners' lipstick. Those who have already seen the relic, are leaving the cathedral no longer in a line but as ordinary passers-by, at a distance from each other, wearing tired and tense expressions on their faces. “How long did you spend in the line?” I ask two women with serious faces. The women suddenly remember to beam like somebody who has had a great joy. The women walk away and their faces once again assume the same tired and tense expression.